Is TGI Friday’s rebrand already working? Last month, TGI Fridays announced it was making substantial changes to better attract Millennials. After decades spent wooing families with seasoned fries and flair, the casual dining chain is now keen to lure Millennials with WiFi, “flexible areas,” and a budding singles scene. “I’d like to say it’s a re-invention, and, to a certain degree, a repositioning,” is how TGI Fridays president and CEO Robert Palleschi described the plan to Nation’s Restaurant News. So what does the data have to say about the re-brand’s progress only a month in? The first impressions look quite good for the strategy. This chart shows the age demographic breakdown of people who spend money at TGI Fridays. The lines are fairly flat for almost 2 years – until very recently, right around the announcement of the re-brand, when Millennials (21-35 year olds) and teens began to make major gains. The great news for TGI Fridays is that its gains with Millennials have not been at the expense of its 35+ consumer base. The raw number of 35+ Americans coming into the stores has not changed. In other words, Fridays is not cannibalizing its revenue with older folks; instead, it is stealing Millennial market share from the competition. Competitors IHOP, Applebee’s, Cheesecake Factory, Olive Garden, and Denny’s have all lost significant portions of their Millennial customer base while Fridays has made substantial gains with the same group. Each competitor is down ~10% on this metric. The next logical question is: so how did this jump with Millennials happen for TGI Fridays? Thanks to SIGNUM’s new bubble charts, which show success and opportunity by quartile, the answers are extremely clear. 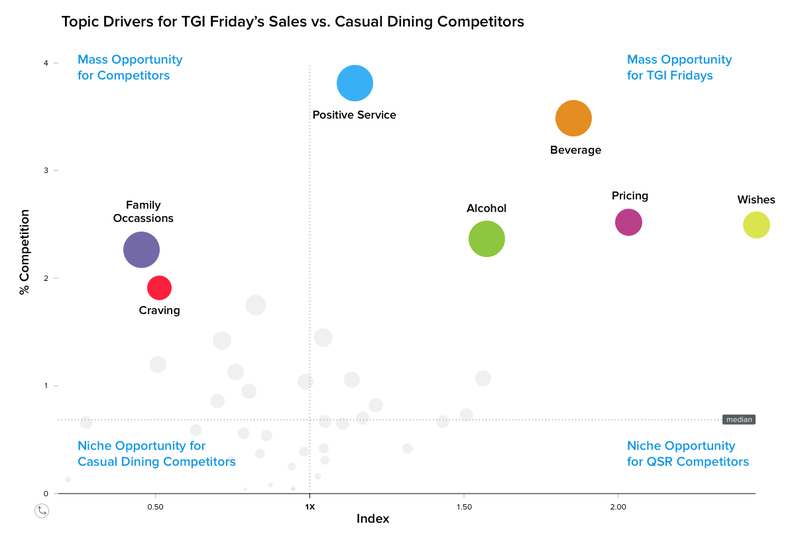 This chart, looking solely at Millennial customers, shows for which topics TGI Fridays over- (and under-) indexes, relative to the Casual Dining competitive average over the last year. The X axis represents the indexing and the Y axis represents the size of topic audience. On the far right we see that Millennials wish for TGI Fridays ~250% more than they do the competition, and that audience size is about average within the demographic. The 21-35 crowd is also drawn to eat at Fridays because of its Pricing, Beverages, and Alcohol – all of which align with the goal of bringing more young people into the restaurants. At the top of the chart, we see a big bubble for Positive Service and that the topic only slightly over-indexes for Fridays. There’s room to grow here for Fridays with a big audience. In terms of under-indexing, we see on the left that the competition is outpacing Fridays when it comes Family Occasions. Again, based on the new branding push, it doesn’t seem the executives at Fridays will lose any sleep over this one. However, right below the blue bubble, we see a red one that shows Fridays is less than 50% as strong as the competition when it comes to Craving. The takeaways for TGI Fridays are clear. The push to attract Millennials is working. The brand is luring them at its highest levels over the last two years, and attracting them away from the competition. The younger audience is attracted to the competitive prices and budding singles scene at the bar. There is, however, room for significant growth when it comes to Crave-worthy food; if Fridays is committed to this strategy long-term it should therefore spin some R&D cycles to serve food that is more eagerly desired by young people. For the casual dining competition the conclusions are equally visible. TGI Fridays is targeting Millennials and it’s working. The competition is already winning with Families; the question now is whether to double down on that advantage or battle for Millennial market share. Regardless, TGI Fridays should be pleased with the early returns.